SUNDAY, May 22, 2016 (HealthDay News) -- While only a few tick species infect people with diseases, the rising popularity of many outdoor activities and the spread of residential developments has upped the odds that one of those creepy parasites might latch on to you. "Luckily, ticks don't fly, jump or fall from the sky," vector-borne disease expert Stephen Wikel said. He's a professor emeritus of medical sciences at Quinnipiac University's Frank H. Netter M.D. School of Medicine, in North Haven, Conn.
"They generally move from grass to a living host, and crawl upwards, looking for a warm, moist area to feed. Ticks also have incredible anti-detection defenses. For example, their saliva is loaded with antihistamines, anticoagulants and other inhibitors that prevent wound healing, and dampen pain and itch responses; unfed nymphs are so small, they can be mistaken for freckles," he said. Protect your ankles. Wear long pants tucked into high socks when doing yard work. Wrap duct tape -- sticky-side out -- around where the pants and socks meet so that crawling ticks get stuck on the tape. Dress properly. Use clothing, tents and other gear treated with repellent, such as permethrin. This repellent kills ticks, mosquitoes, chiggers and mites. These products are available online or at sporting goods stores. Wear repellent. Apply topical insect repellent that contains less than 40 percent DEET. Children should use repellent that contains no more than 30 percent DEET, Wikel said. Conduct tick checks. "Tick bites are painless, so if you are in an area with ticks, perform a thorough tick check and remove ticks immediately," he advised. Don't forget pets. "The neurotransmitter blockers in anti-tick treatments and flea collars are very effective in keeping ticks from biting pets," said Wikel. "When pets come indoors, check for crawling ticks to prevent them from getting off your pet and on to you." Create a tick-free zone. You can make your yard less attractive to rodent, deer and other tick-carriers. Keeping lawns trimmed and creating barriers between your yard and the woods with wood chips, mulch or gravel can eliminate tall grasses where ticks crawl. Remove wood piles and stones where mice, chipmunks and squirrels may hide. These little critters keep tick larva and nymphs circulating in nature. Hike carefully. Stay in the center of hiking trails to avoid contact with vegetation. If despite your best prevention efforts, a tick still attaches to you, there's a right and a wrong way to remove ticks, Wikel cautioned. Don't use matches or the tip of a cigarette to burn off ticks. This could cause them to transmit bacteria more quickly. The correct way to remove a tick is to lift it gently with thin forceps or tweezers. It's also a good idea to use a magnifying glass while removing a tick, Wikel advised. If you can remove the tick intact, you can bring it to your doctor's office or local health department for identification. 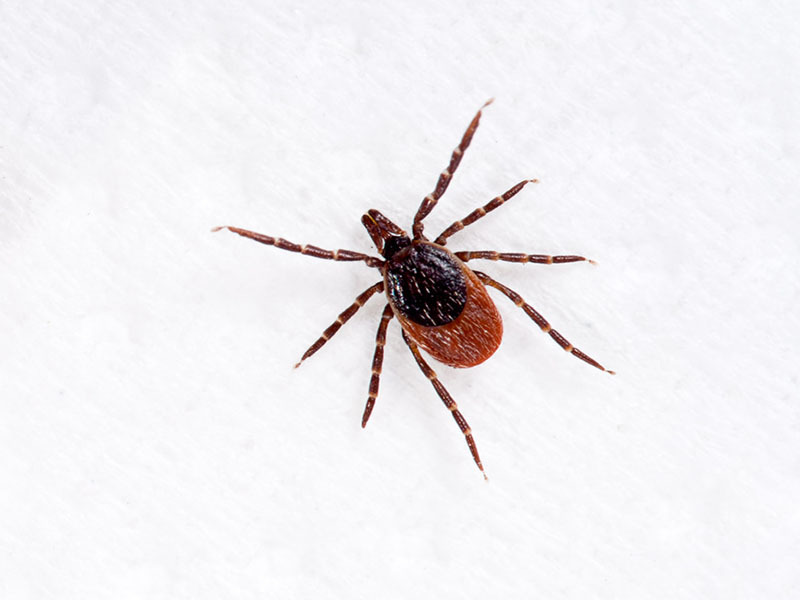 If you develop symptoms within a few weeks after a tick bite, make an appointment with your doctor, advises the U.S. Centers for Disease Control and Prevention. Warning signs of tick-borne diseases may vary from person to person, said Wikel. Symptoms, which can range from mild to severe, may include: fever and chills, headaches, fatigue and muscle aches. People with Lyme disease may also develop joint pain, he said. "Many people think a sign of Lyme disease is a bull's-eye rash, but rashes don't always occur," said Wikel. If left untreated, Lyme disease can affect the joints, the heart or the nervous system. When diagnosed early, on the other hand, Lyme disease can be cured with antibiotics. This is the case for most tick-borne disease, Wikel said.